Exploring Spain by foot, mountain bike, cycle touring or even on water has got easier following an agreement between ViewRanger, the outdoors GPS navigation app and the National Map Authority - Centro Nacional de Informacion Geografica (CNIG). It is now possible to download topographic maps for the whole of Spain and its Islands on to a smartphone and use them without a cell phone connection. 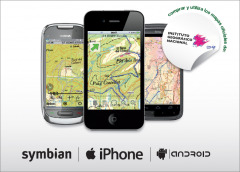 To access the maps you first need to download the free ViewRanger app and then purchase Spanish maps through the in-app store by province or region. ViewRanger also allows the flexibility to purchase just the mapping required on a by-the-tile basis, perhaps to create a custom map to hike along one of Spain’s famous national trails known locally as Gran Recorrido. Ian Pond Marketing Manager for ViewRanger explains, “With ViewRanger, you can purchase and download the maps in advance using a Wi-Fi connection, then they can be used even without network access, and there’s no risk of incurring data roaming charges. ViewRanger enables friends to follow your progress using the location-sharing feature BuddyBeacon*. The app is fully integrated with social media such as Facebook and it allows you to record your route and then tag tweets, video commentaries and photographs to locations on the way, allowing you to create a travelog for sharing. In addition to mapping, ViewRanger also provides a library of recommended routes from well-known publishers and its user community. Already for Spain it has English language guided trails from “Discovery Walking Guides” and from WalkingWorld. The ViewRanger app runs on Apple iPhone and iPads, Android smartphones like those of Samsung & HTC and Symbian devices and is free to install from the relevant app store including open source mapping. Premium mapping such as the Spanish CNIG mapping is available from €4/€5 for a Province area at 1:25,000 or whole region at 1:200,000. *real-time service requires data connection.